Markham Florists - Flowers in Markham ON - Metro Florist Inc.
We just wanted to extend our thanks and appreciation. The flowers for my mother’s funeral were done perfectly just how she would have loved them. Again much appreciation to everyone. "I want you to know that it was a pleasure to deal with you. 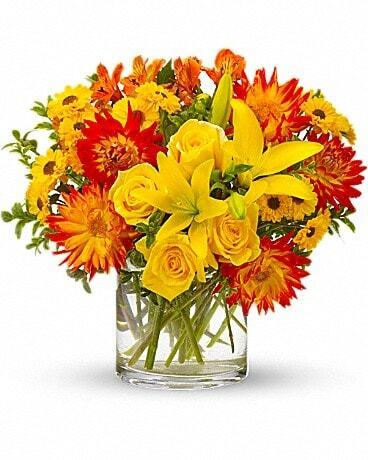 You are wonderfully efficient and well organized, and your delivery of flowers went off without a hitch. I was impressed firstly with your return phone call to me, and the woman I talked with was very pleasant and helpful (I wish I had asked her name). Then, I was pleased to see a confirming email right away, and subsequently a follow-up email to tell us the flowers had been delivered. Our message to our sister-in-law was absolutely correct, and the bouquet was quite lovely. The birthday girl called right away to thank my husband me, and she was tickled pink; she said it "made her day." So, thank you very much. We will be sure to use Metro Florist again, when an occasion arises. I wish you continued success in 2018. Sincerely, Marie"
"Thank you for the beautiful flower arrangement that you created and delivered for my uncle`s funeral. It was greatly appreciated by the family. Catherine "
Thank you very much for the beautiful orchids you delivered to Stouffville today. You made two amazing women cry when they saw them. Thank you again. We wanted to thank you for making Katie and Patrick's wedding a great success. The flowers were outstanding, the girls bouquets complimented their dresses beautifully. Katie's bouquet was stunning as well. Thank you from the bottom of my heart for the BEAUTIFUL work done to prepare the floral arrangement for my mother-in-law’s funeral. It was done to perfection and Mother Lue would have loved it. Everyone was truly happy and we all are extending our thank you all. (Thank you so much!! The flowers were perfect and my Mom loved them :) Thanks for making things right, and for helping to make her day extra special - I'll definitely be recommending you and keeping you in mind for my next flower delivery! Last week you did an arrangement for the a Funeral. The family was so pleased with the arrangement. I saw a photo and you did a wonderful arrangement complimenting the other flowers the family ordered while making the arrangement I sent a bit different. Many thanks for changing the color to less purple. The pink roses with white looked lovely and the off white roses were also beautiful. Thanks so much for your service. It has been a pleasure to deal with you. The flowers that you sent were beautiful, and we were sent a picture to show how much they were liked. Just want to say thanks for the beautiful flowers and decoration. The two arrangements are stunning! Thank you for all the great flowers and customer service over the years. Best of the holiday season to you and your staff. Only good things in 2017! I really appreciate your prompt customer service! The flowers were very beautiful! I want to thank you so much for the beautiful flowers that you did for my husband's funeral, they were absolutely beautiful, I was so pleased with your selection. My husband used to order me roses from your flower store and they too were always beautiful, I will miss getting them for our special occasions. Once again, thank you with all my heart. Metro florist made my wedding absolutely amazing!!!!!!!!!!!!!!! Such beautiful work and organized! Grace - thank you for everything! I want to thank you for your customer service. It was very thoughtful of you to have these flowers sent for the viewing, as I didn’t think of that. Should I require flowers again, you will be our florist!! They were one of the chosen few to go to the Church and left at the Church for the parishioner's to enjoy. last night at a funeral with the butterfly it made me smile. So thank you for your personal touch. Your flowers were tremendous. Thanks for your hard work. Thank you. The floral arrangements are lovely. My family really appreciated all the fine work that went into them. My dad would have appreciated the special treatment you gave his flowers. Thank you so very much for the beautiful centre pieces that you donated for the Volunteer Appreciation Brunch we had on Friday Nov 20th. They were beautiful! and we had so many wonderful comments about them. I made sure everyone knew where they came from, and afterwards, some of the guests were asking where Metro Florist was located. We were so grateful for your kindness and your generosity. It just finished everything off beautifully! I am e-mailing you from my place of work, to thank you. I arranged a floral deliver through our local florist here in NS, Silver Horse in Kentville, and they in turn did a wire service through you folks up in Markham, On. I was sending an arrangement to a very special Aunt in Markham who is turning “90” and flowers were the best thing my family could have sent her and you folks are not too far from where she lives. She called right after the delivery of the flowers she was so excited and said how lovely the flowers were and of course it was a surprise she didn’t know about. She now knows about Metro Florist and the quality of your work so she has decided for future flower orders she will contact you. I’m not sure what the arrangement looked like, my cousin is going to take a picture to send me. I have called Silver Horse to let them know the good news on how the delivery went. Thank you for helping make a special Lady’s day, she can’t say enough about how lovely the arrangement was and how it made her feel special. Thank you so much Grace!! You did a beautiful job! The flower arrangement was so beautiful! Have a nice day! Metro Florist is now my go to florist whenever our company has to send out flowers. Their arrangements are amazing and beautiful and they get everything right. Grace the flowers were absolutely gorgeous!! Thank you so much for personally seeing that were perfect!!!! Everyone commented on how beautiful they were!! A big THANK YOU on behalf of our family! Thank you so much the spray of flowers were absolutely beautiful. The service was lovely and the flowers gave the inspiration we all needed. I just want to say thank you so much for the excellent service. My friend truly loved the flowers. You really know how to treat customers. I will definitely be using you again and again. I just wanted to let you know the arrangements you did for us looked beautiful!! I brought the vase home to enjoy at the reception that we hosted after the funeral and the flowers are still looking great!! Beautiful job with both of the arrangements you did for us. Thanks so much. P.S. I'm out of country and these flowers were fresh and nice and very important for my wife and me. I just wanted to let you know that both of the flower arrangements that I sent to Winnipeg recently, were absolutely beautiful! I would really like to thank you and the florist in Winnipeg. I was in Toronto for the funeral service yesterday and I was able to see first hand the beautiful plant arrangement that I ordered from you. It was beautifully put together and we were very happy with the results. I cannot express enough thanks to you for the gorgeous bouquet sent to my mom . It was exactly what I hoped it would be. My mom couldn't stop talking about it. It was beyond anything she expected! Thank you for taking the time to help me with the flower selection, for helping me stay within my budget, and for your fantastic advice and patience with a newbie like me :-). It was such a pleasure meeting you. If I ever need flowers again, now I know where to go. Thank you for everything! My wife was touched and impressed with your floral arrangement. Thank you very much for making her day!!! Just wanted to say Thank You very much for the beautiful floral arrangements you made for my Mother-in-law's funeral. I really liked the banners and the tulle. The overall effect was fantastic. Seeing that you also did this with us ordering it for the same day, is a credit to your efficiency as well. It was a fitting tribute to her as she loved flowers and gardening.